Children are being endangered by their parents' obsession with smartphones, lifeguards in Germany have warned. The German Lifeguard Association (DLRG) has linked a series of recent drownings to parents who were too busy with their mobile phones to keep proper watch over their children. "Not enough parents and grandparents follow the advice: when your children and grandchildren are in the water, put your smartphone away," Achim Wiese, a spokesman for the DLRG, said. This northern summer has seen an alarming increase in drownings in Germany, as families take to the country's lakes, rivers and beaches to escape the heatwave. More than 300 people have drowned so far this year, including 20 children under the age of 15 and 40 people between the ages of 16 and 25. Recent cases include a 7-year-old boy whose body was found in a natural open air pool where he had been swimming in Bavaria. "We see people on a daily basis who treat swimming pools like a kindergarten and just don't pay attention," said Peter Harzheim of the German federation of swimming pool attendants. "Parents and grandparents are too busy staring at their smartphones to look around them, and certainly not to watch over their children." Lifeguards have warned that drownings are rising because people are not taking the risks of swimming in natural water bodies such as rivers and lakes seriously enough. "The risk in these places is very high, since there are no lifeguards," Wiese said. The German Swimming Association has called for the Government to do more to provide swimming lessons and ensure that all children have access to swimming pools. 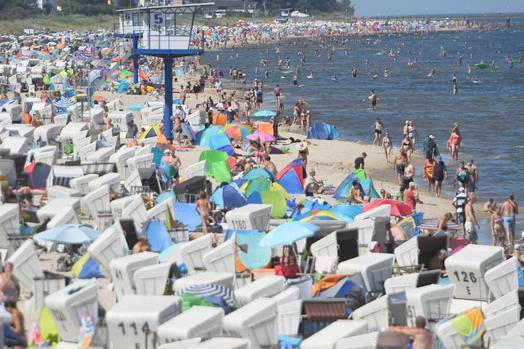 Pictured above … Hundreds of tourists in the Baltic Sea resort of Heringsdorf on the island of Usedom, northern Germany. Photo / AP.